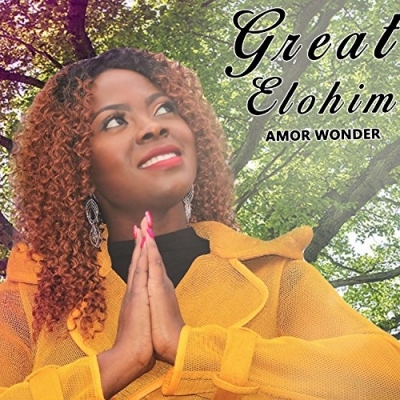 Talented Gospel singer and writer Amor Wonder has released her new single 'Great Elohim'. Amor is currently praise and worship leader at her local church, OFM MD, and part of Dulous worship band, Cornerstone Church, Bowie. "Born to African parents, both choristers ( Cameroonian father and Equato Guinean mom), and last child of four, who all happened to be music lovers, I grew up listening to all kinds of music", explains Amor. "I don't remember a day going by at home without the record or cassette player or CD player, playing from morning till evening! There was always a joyful and lively atmosphere in the house! Music is life, someone said. At a very tender age I realized I loved to sing. During my free time i would sing all the songs I heard, from church hymns, to R and B, African rhythms, Hindu songs, you name it. I loved to sing! At school I started taking part in musical presentations and eventually joined acapella groups and school choirs. Shy as I was, I would somehow still find a way to stand before a crowd and sing! Even when I did not feel like or felt nervous, there was something inside of me that kept pushing me. When I encountered the Lord Jesus and surrendered my life to God, it all made more sense to me. I quickly discovered this was what I was born to do and felt fulfilled singing, praise and worship songs to God and singing in church. I remember my first christian acapella group, with my sister Minister Quincy Bell! It was such a blessing. Family and friends took notice that I was destined for this! They loved to hear me sing. Many said they were blessed. I had so much encouragement around me. Many years later, after a period of "lost passion" for what I considered the reason I was created, God reignites His fire in me and equips me for that which He called me. Inspires me like I never dreamed of. Stands by me, walks with me and backs me up to do His will. Simply amazes me how God's plan for your life will always come true, no matter the obstacles. He is my inspiration and everything He gives me, is not only for me, but largely for the world out there, the broken, the lonely, the rejected, the weak, and even the strong and joyful. My desire and earnest prayer to God is that His words reflected through my music and worship would restore,transform, save, deliver, heal; bring us to experience Him more intimately and come to the full knowledge of who God created us to be."